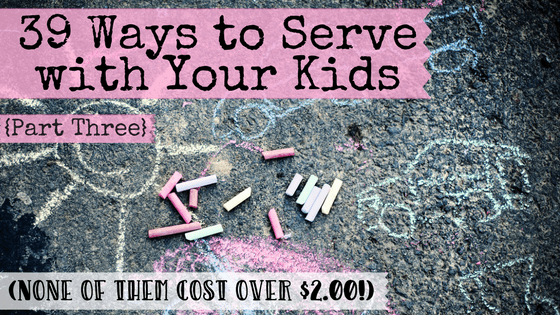 This is the last post in our series of 39 Ways to Serve With Your Kids. If you missed part one or part two, be sure to check them out. If you’d like to download a printable PDF of all 39 ways to serve together, please fill out the information at the bottom of this post. Often times when people think about service projects, they imagine serving at a soup kitchen or building houses for Habitat for Humanity. And while those are awesome endeavors, serving others can take on a lot of different forms. In this season of our life, getting everyone out the door to go to the grocery store is a big deal. The trip has to be perfectly timed after breakfast but before lunch, and I have to pack a midmorning snack. Going after lunch isn’t an option because of nap time. After nap time, there’s afternoon snack time and then dinner, baths and bed. So arranging a time for us to get to a soup kitchen to actually serve people would be almost impossible/ absolutely miserable. Fortunately, the Bible is pretty clear that we are to serve others in whatever way we can. And just like everything else in life, the type of service projects we are able to do will change as our kids grow up and as we grow old. At this point in our life, we are looking for easy service projects for kids. We can serve others in seemingly small ways that might make a huge impact. The key to teaching your children to serve is to simply do it all the time. Kids learn best through repetition and routine. So make serving others such an integral part of your family dynamic that it becomes a habit. Teach them to give freely of their time, energy, and resources so that they can grow up thinking that is the norm-not the exception. Our last church bake sale raised around $700. That is huge! When you are organizing the bake sale, be sure to explain exactly what the money is going towards. People give generously in support of good causes. You will also want to publicize the bake sale for several weeks before the big day so that people have plenty of time to get their money and their muffins ready. Talk to you child’s teacher to find out if there are any students in their class that need books at home. Let your kids go through their own book collection and choose a few they’d like to pass on to a classmate. Send the books to school in your kid’s backpack, and the teacher can send them home in another kid’s backpack. This is a great way to teach about doing good for the sake of helping others rather than for recognition. We use Matthew 6:3 to illustrate this. Having been a public school teacher for years, I know firsthand how exhausting it can be. It seems like God always used a parent to send me encouragement at just the right time. I would feel completely burned out, exhausted, and like I wasn’t making a difference when a parent or student would bring me a little gift or card to let me know that I was making an impact on lives. I don’t remember much about the actual gifts. They were often just small tokens like a pack of Expo markers or Post-it notes. What does stand out in my mind is the feeling it gave me. I felt renewed and ready to take on the day. I smiled every time I used one of the gifts. Flowers sitting on a desk can bring cheer for a whole week. 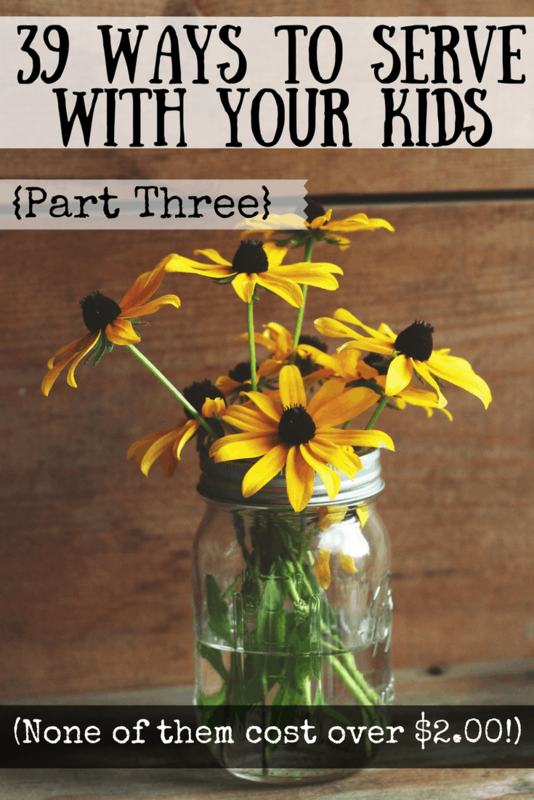 A homemade wildflower bouquet that your child helped to make, will mean a lot to their teacher. A lot of people don’t realize how much work it is to get a classroom cleaned up after the school year. It takes hours upon hours to sort through and pack all the papers, supplies, and stuff. In most schools, everything must be removed from the walls and shelves and packed away. The janitors actually clean the room, but everything must be left in a certain way. Typically teachers are given a 20-30 item checklist to complete before they are able to go home for summer. Letting your kids help clean up part of the mess from a year of teaching, will also serve to show them how much work goes into educating them. My family has approximately 397 pieces of sidewalk chalk at any given time and 70% of the chalk ends up on my children and their clothes every time they play with it. Having been on the other side of a similar kindness attack recently, I can assure you that it made my kids happy for weeks. They spent lots of time every day discussing who could have put the pinwheels in our yard. They talked about which one was their favorite and why. 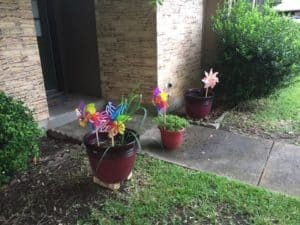 They stop and spin them every time they walk by them on their way in or out of our house. I have no idea how much those cost, or who did it, but it was money well spent. This is something that my family always did together, and it was such a neat experience. Since it is typically pretty cold during the Christmas season, standing outside all bundled up was not fun. But it did give me a tiny glimpse into some of the suffering of the homeless. When our shift was up, I got to go inside my warm car to get to my warm house to eat warm food while wearing warm clothes. The homeless? They are stuck outside. So give your kids a chance to feel some empathy. My kids love buying the $.50 seasonal flowers from the grocery store. We plant them in pot and care for them. They make us smile every time we pass them going into or out of the house because the planter is right beside our front door (see photo above). Giving this simple gift to a neighbor would make them smile just as often. If you have a green thumb, you could even just propagate a piece of one of your plants to give to a neighbor. The flowerpot doesn’t have to be fancy. You could use a spray painted coffee can or washed out glass jars! This has been a hard one for me. I want our house to look perfect, but we have four kids. But Jesus calls us to be hospitable. He wants us to foster relationships – real relationships. He doesn’t say to show hospitality as long as your house is spotless. So invite people into your home. Fellowship with other believers or show nonbelievers how much you love them – even if your house is a mess! I’ve donated my hair twice now and it is a great feeling. Granted I know you aren’t supposed to do good things just to get that good feeling, but it helps. One of the reasons is that it cost me nothing. Nope, sorry it might damage my hair that I’m growing out to donate. Blow dry and straighten it? Nope, sorry. I can’t donate damaged hair. If you aren’t familiar with Pantene’s Beautiful Lengths, they are a charity that makes wigs for women who’ve lost their hair due to cancer treatment. You can read more about them here. We made it eight years before we had to take a child to the emergency room, but when we did it was horrible. If you’ve ever had a kid so sick you felt like you had to go to the emergency room, you know how awful it is. We jumped in the car and raced to the hospital only to have to wait for hours. We didn’t think to grab anything to entertain him, and he was miserable. If there had been some coloring books and crayons or even some nice board books, it would have made our waiting tremendously more pleasant. Be sure to check out the dollar store for a surprisingly good selection of books and some really okay crayons. My children are so blessed because they have so many adults who care about them. They have Sunday school teachers, Wednesday night teachers, coaches, school teachers, family members, and parents of their friends. The thank you note doesn’t have to be long or elegant to be special. For our younger kids, I write out the words on a piece of paper and let the kids copy them onto the thank you cards. For our older kids, we talk about what a good thank you note says, and then, they write out what they want. The cards have misspelled words and are often very difficult to read, but they are sincere. I could definitely do the job quicker and more neatly myself by typing and printing them or just neatly handwriting and letting my kids sign them. But that misses the point. You should take time to write a thank you note to someone who has invested their time in you. If I speed up the process in order to make a neater card, then I rob my kids of the experience. My kids love doing craft projects. They love drawing and cutting and glueing and taping and coloring, but they rarely do it. Which is totally on me because I hate the mess. So, I’m committing to letting my life be filled with glitter and colored pencil shavings for the sake of serving others. Because I know that their grandparents and aunts and uncles love getting craft projects from my kids. So, I’m going to let them create away, and then I’m going to package up the creations as neatly as possible so that our family doesn’t think they’re receiving a cleverly disguised glitter bomb. I’m going to make the trip to the post office and actually mail the stuff. This one may sound weird, but hear me out. At every point in our life, God has given us senior adults that loved us. The relationships never felt forced or awkward, and instead brought such joy. When my husband was in seminary and we were living in Tennessee, eight hours away from our family, our best friends were Bill and Carol Morris. We ate with them at least once a week and went to local plays, picnics, and game nights. We were in our twenties and they were in their seventies. They loved our kids and helped to keep us from ditching seminary to move back home. We met them in church and that’s the place that so many of our great relationships have started. If you don’t have a church home, I cannot recommend it enough. Yes there are hypocrites and terribly judgmental people in churches. But there are also really great people, like Bill and Carol, who know they are sinners saved by grace and who relish the opportunity to be the hands and feet of Jesus. 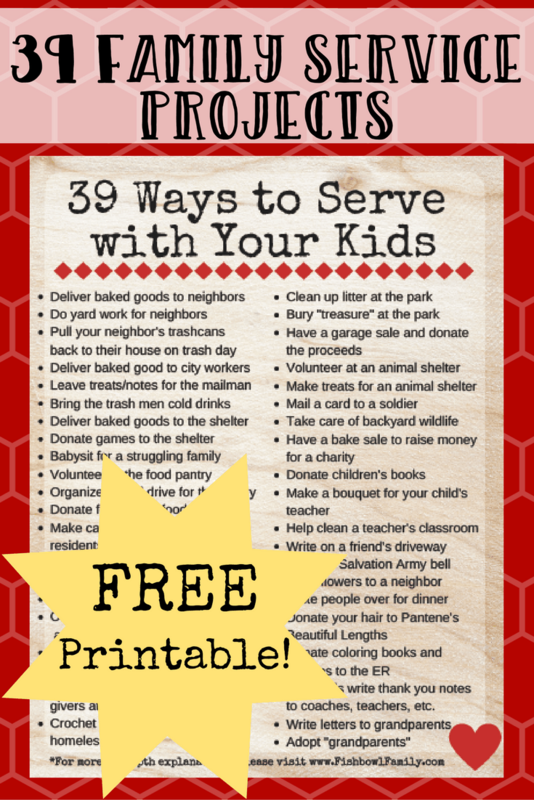 That’s the end of my list of 39 ways to serve with you kids! I’m sure there are many more really great and easy service projects for kids that I missed, so be sure to share your ideas in the comments. If you missed part one or part two, be sure to check them out. If you’d like to get this list as a printable PDF, fill out the form below. What ways has your family found to serve together? You’re welcome Lacy! I hope you find some ideas for your family to do together! Love these too! I’m making a LauriePOP Ideas That POP YouTube video of ways kids can help victims, and I’m going to ping your pinwheel idea. Love those last few paragraphs. Life gets so busy! It’s great to instill in your children a spirit of service. Awesome article!